Our Michelangelo Series of medallions come completely finished and ready to install on your ceiling. The medallions project 3-4" out from the ceiling so they provide another element of depth to the room. They are built from fiberglass, pvc, and other high-impact materials and come ready with a hole in the center for your lighting fixture. 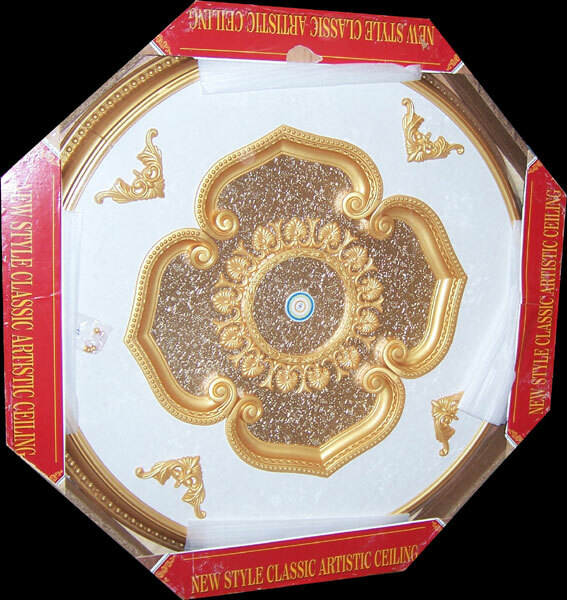 If you are not installing a lighting fixture with the medallion then you can still use these by ordering a small rosette to cover the medallion's center hole (if you call us we will paint the rosette to match the medallion for you). View the gallery of installed projects. We would love to receive a picture of your finished project. Email photos to projectphotos@wishihadthat.com. The ceiling medallions are flat on the back so they can be installed on any flat ceiling or wall. They are delivered fully assembled so they are easy to install. Since these are large medallions be sure to have at least 2 people involved with the installation. The weight of the ceiling medallion varies based on the model; you can find the weight by viewing the installation instructions. Read the Installation Instructions. Free Shipping is included on all of our Michelangelo ceiling medallions. They are packaged in a thick chipboard crate to protect them during the shipping process. All of the medallions that are more than 43" in size are sent using a freight carrier (smaller medallions normally ship via UPS or Fedex). When delivering to a residence the freight carrier will call prior to delivery to arrange a delivery time. For more details on shipping please visit our Shipping Page.